This is Page 1 of 4 - the best of March 2015! 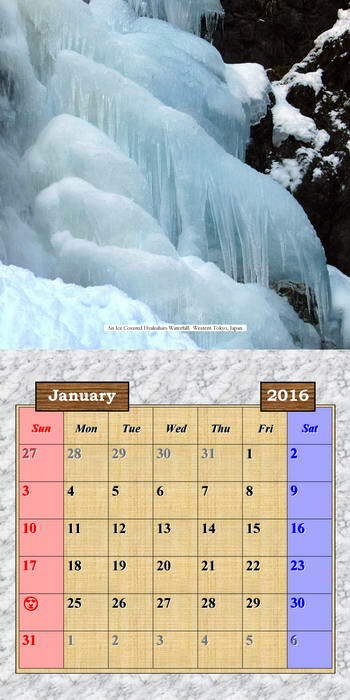 This page begins with a showing of 2016 Print Edition Calendars which are available through Amazon or any bookstore. If you want to purchase, or just want to see them, then please click on the Amazon link just below Row 1. 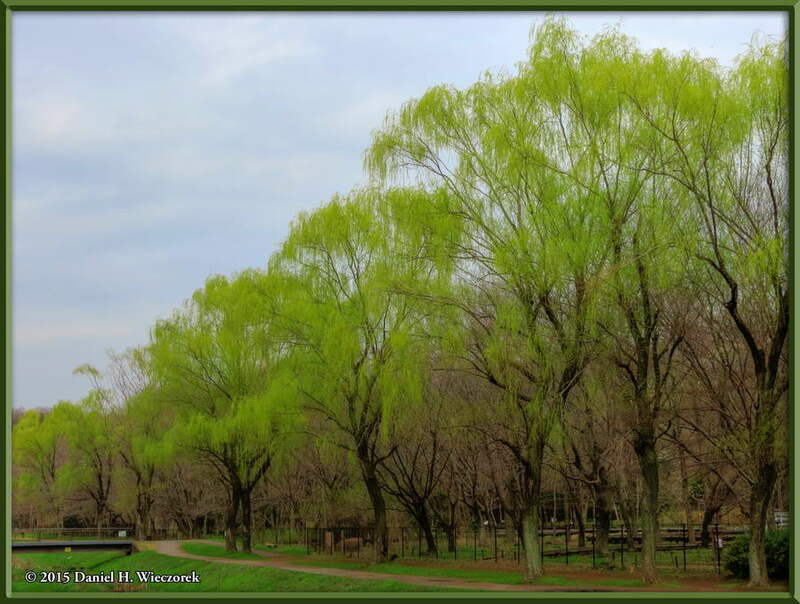 After that, Row 3 begins a bicycle trip to Nogawa Park on March 21st - the first day of spring here in Japan. The 21st is the only date you'll find on this page. Click on any thumbnail to begin. 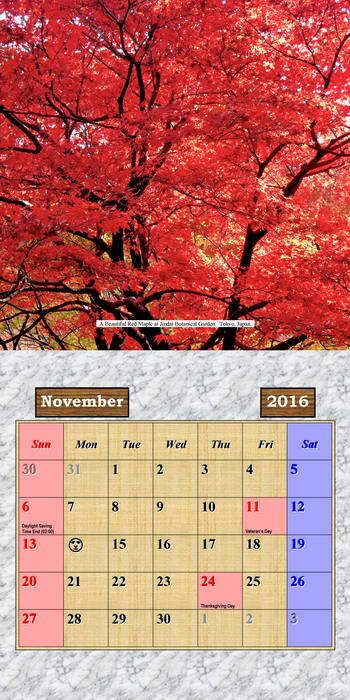 These 3 images show the covers of the 2016 Print Calendars - an International Version, with no holidays shown, a Japanese Version, which shows the National Holidays of Japan and also a USA Version, which shows the National Holidays of the USA. HERE is a link to the Amazon page which shows all 3 of these calendars. The first image in this row shows what the International Version January page would look like when hanging on the wall. 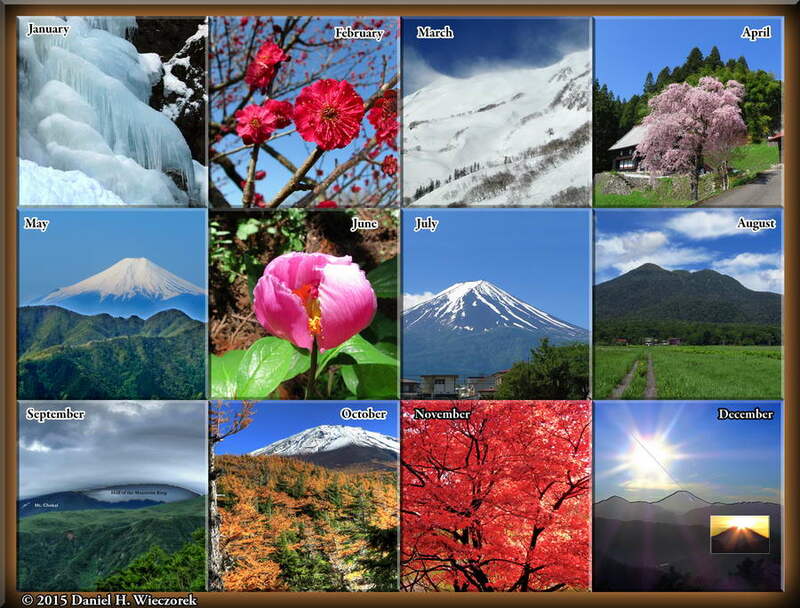 The center image shows the 12 photos which are used with the various months. The 3rd image shows the November page of the USA version. If you're interested, the "Outdoor Photography of Japan: Through the Seasons" book is now available at Amazon, as well as your local bookseller, in a HARDCOVER Edition! Just go to Amazon.com via the link just below and either order it there or else write down the ISBN and ask your local bookstore to order it for you. And now, let's proceed to Nogawa Park. You may recall that this park is about a 10 minute bicycle ride from our apartment. 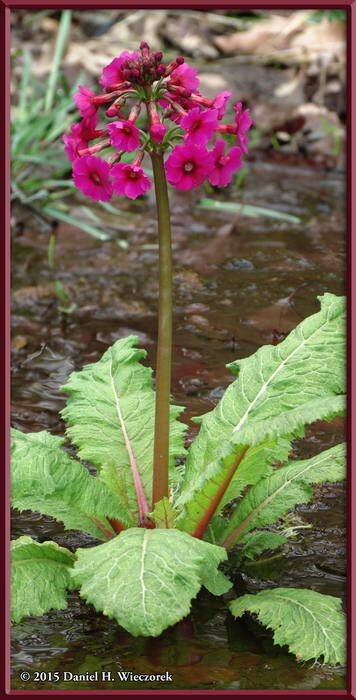 We were very surprised to find a Primrose (Primula sp.) in bloom already. It was so pretty. 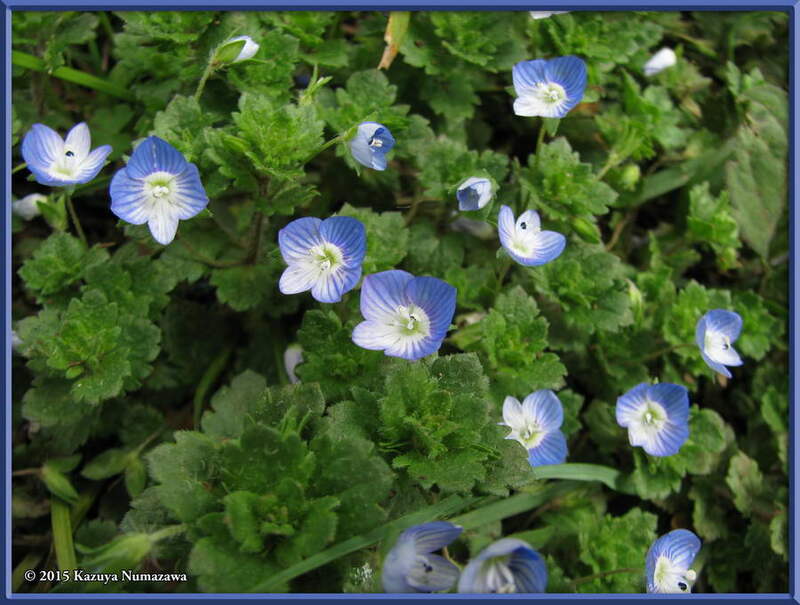 Why is this one plant in bloom already though, while none of the others are? 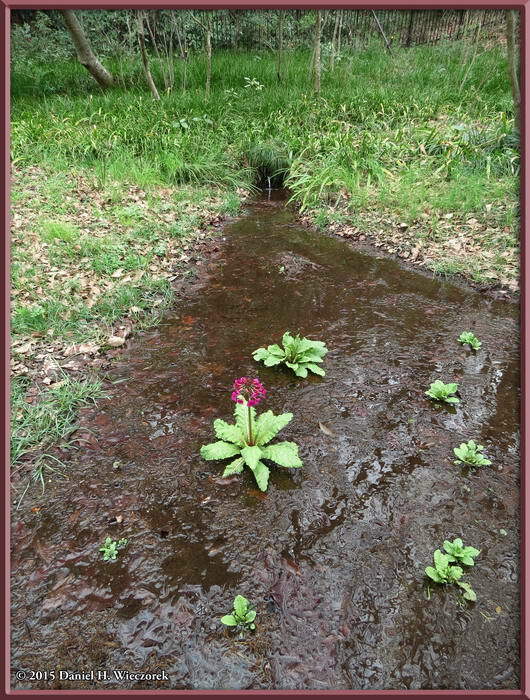 Here are two different 2-photo collages which show this single blooming Primrose plant. 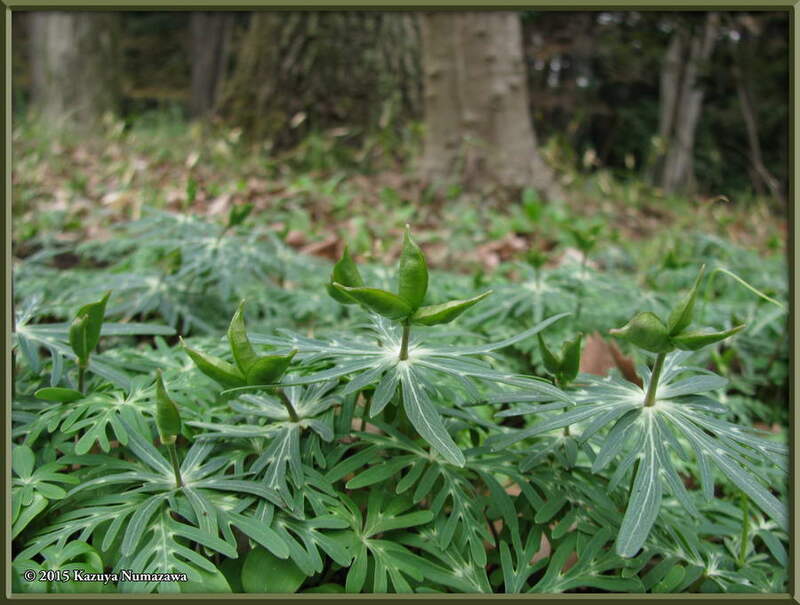 I zoomed in and took a photo of the top portion of the plant and then shot a photo of the lower portion of the plant and then created these two collages in Photoshop. 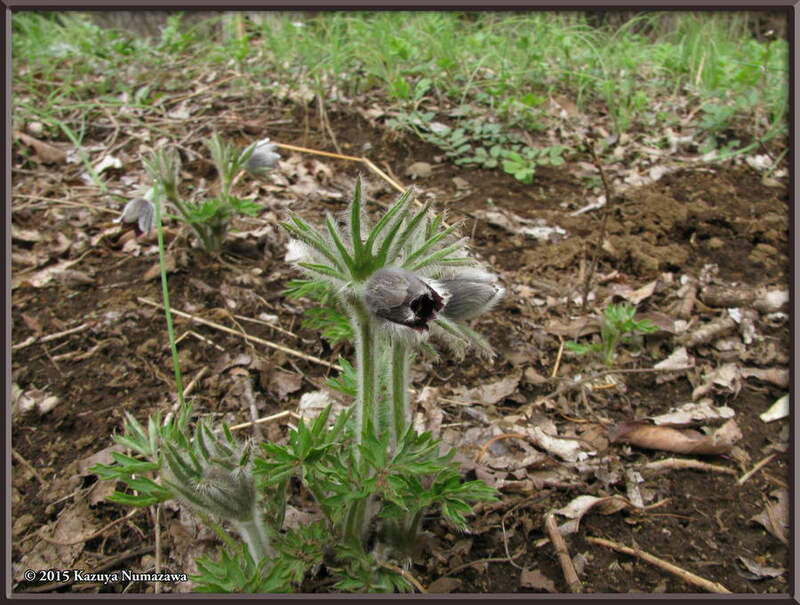 If you remember, last month we showed you some photos of Shibateranthis pinnatifida (Setsubunsou in Japanese) in bloom, well here are the seedheads of this plant. 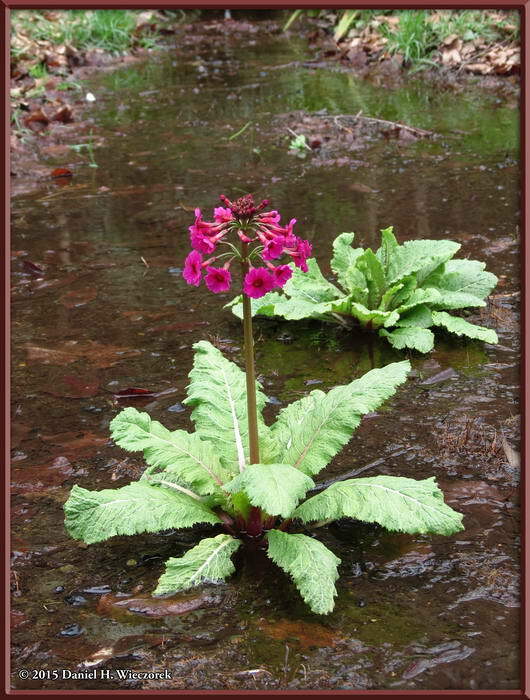 If you need to refresh your memory of last month's photos of this plant in bloom CLICK HERE (new window or tab). 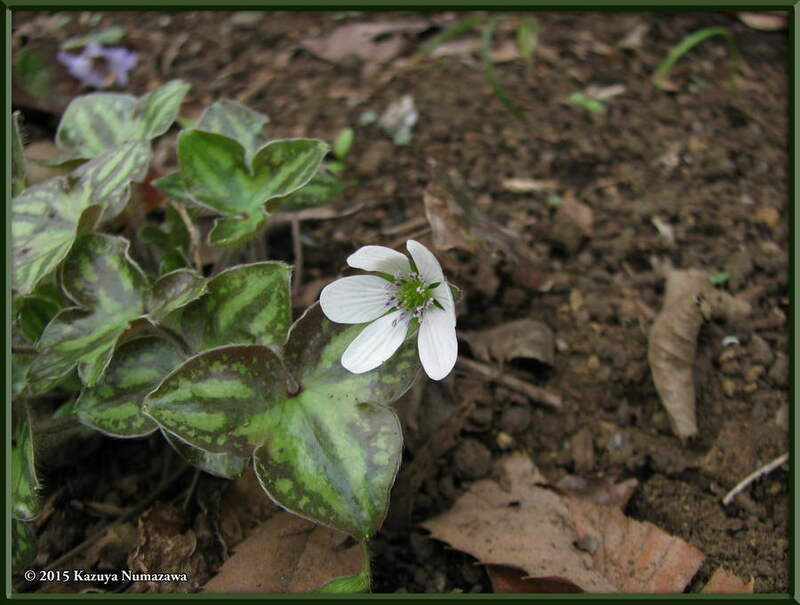 The 3rd shot is of a Hepatica nobilis var. 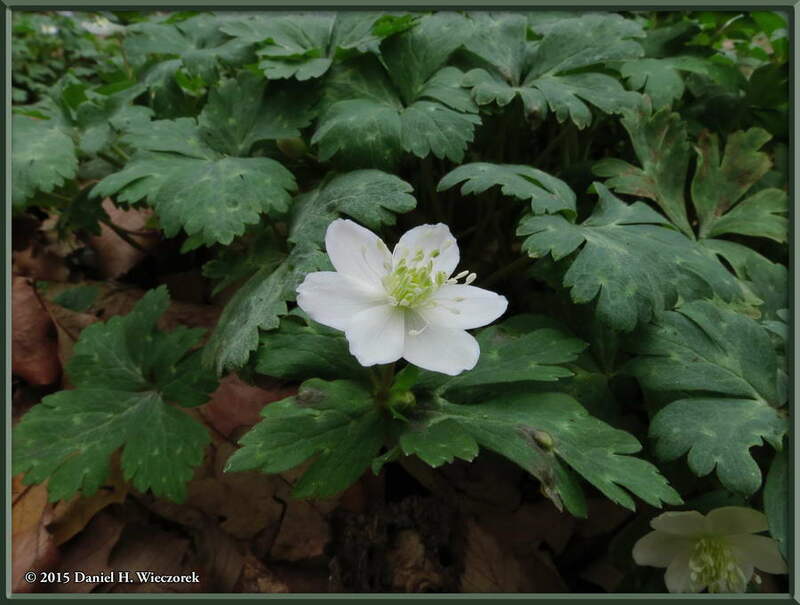 japonica f. magna. 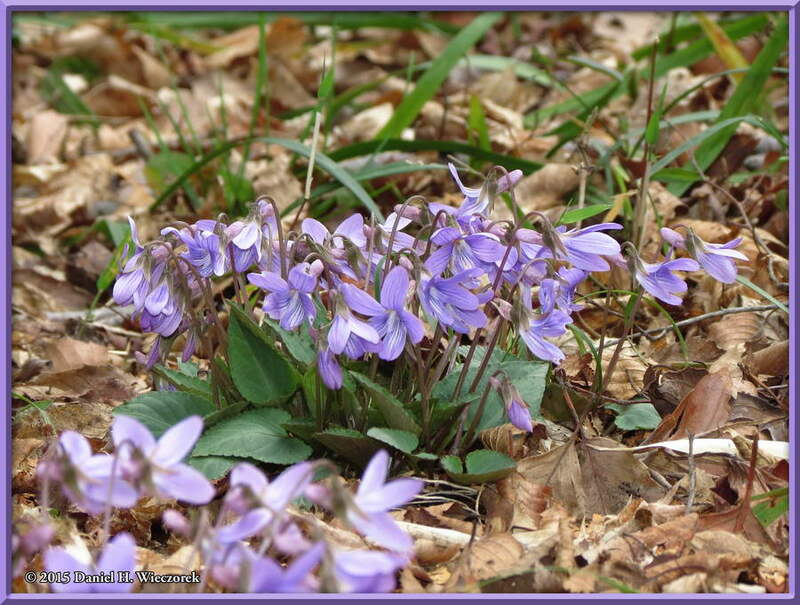 Here is one more shot of Hepatica nobilis var. 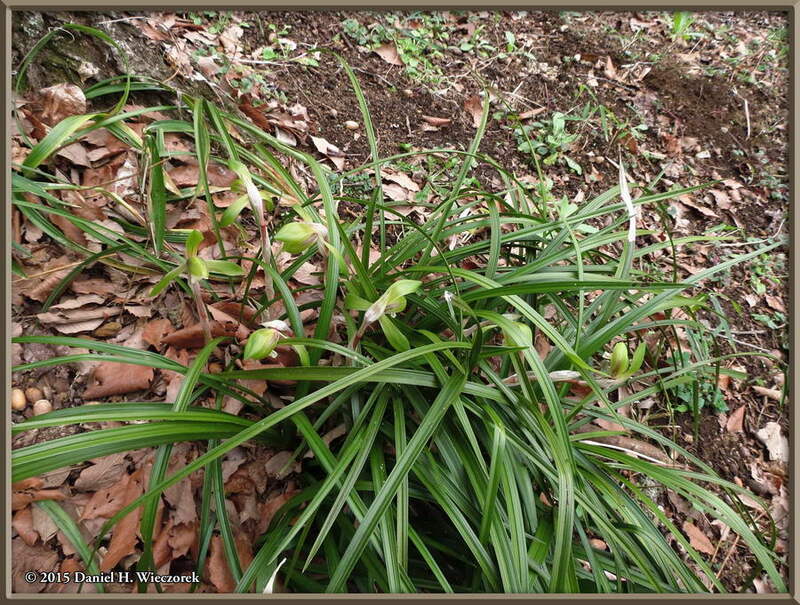 japonica f. magna and that's followed by 2-shots of Cymbidium goeringii - an Orchid (Shun-ran [Spring Orchid] in Japanese). 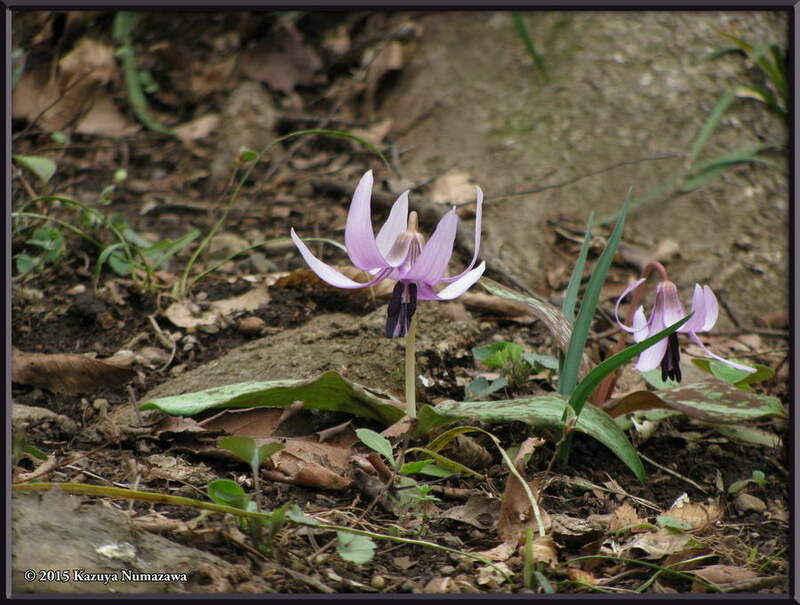 In this row are 2 shots of Erythronium japonicum - Trout Lily (Katakuri in Japanese) and the 3rd photo shows an Anemone flaccida in bloom. 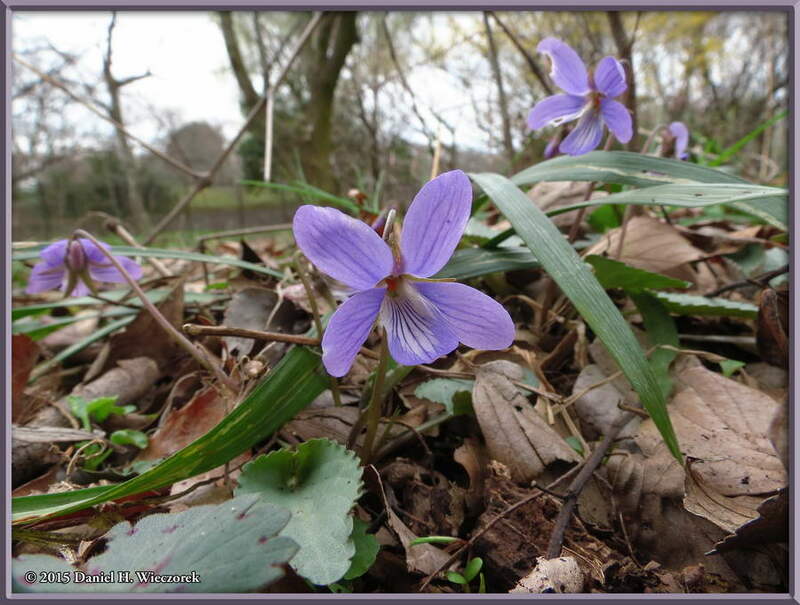 The first VIOLETS! 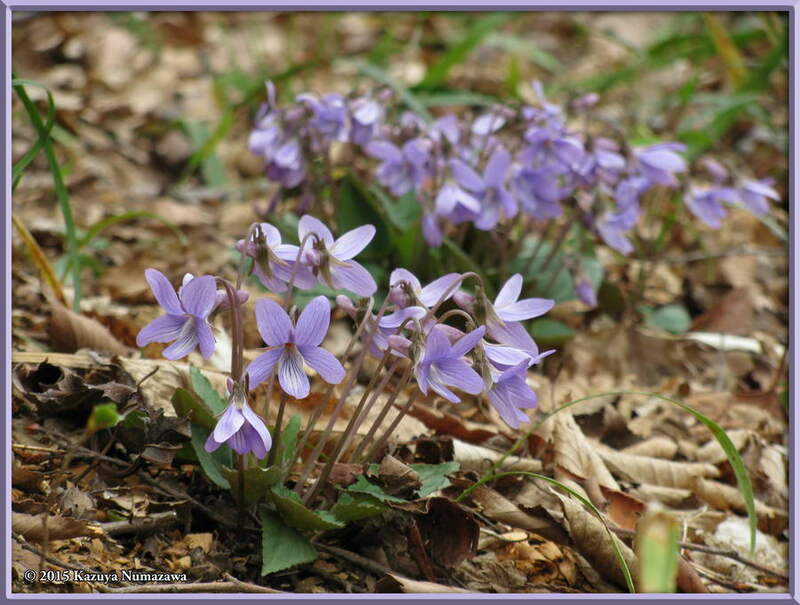 The first 2 shots here show the beauty of Viola japonica. 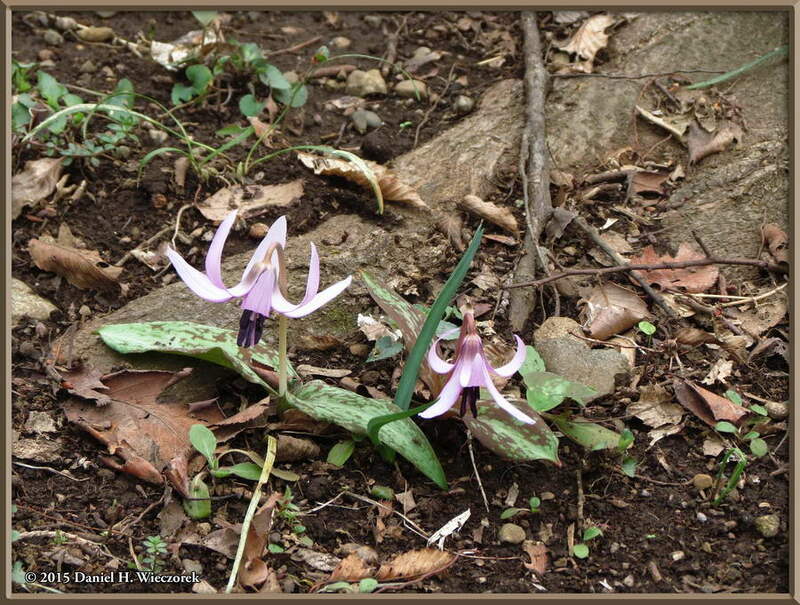 In 3rd position is another shot in which you can find Erythronium japonicum - Trout Lily (Katakuri in Japanese). 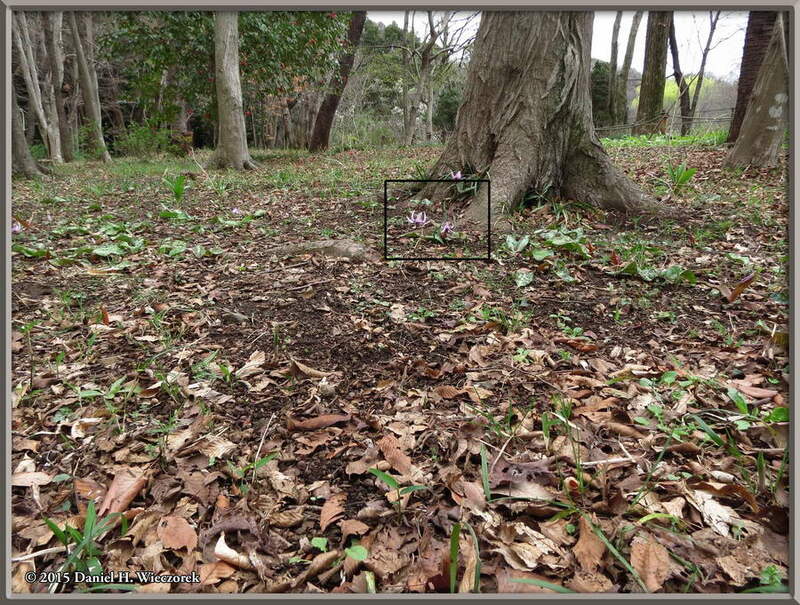 They are inside of the outlined area, which also shows the area which is included in the next photo. 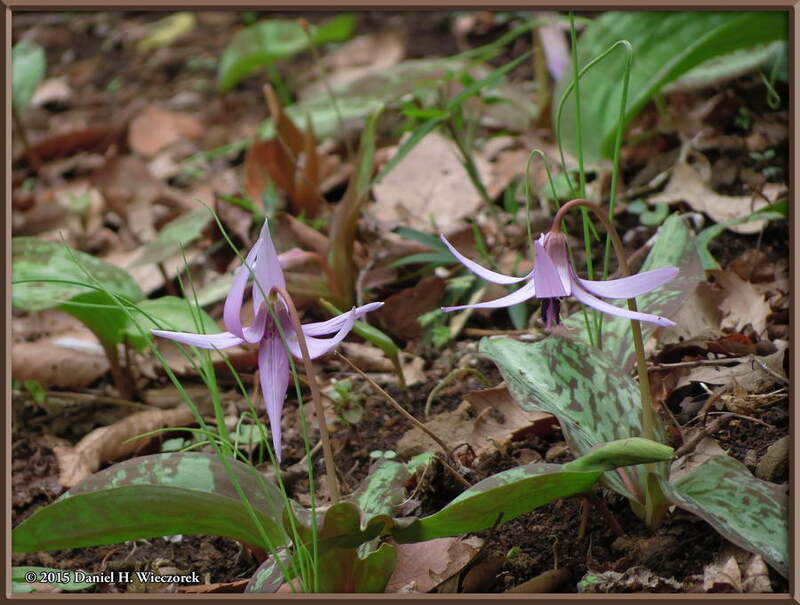 The first shot in this row shows the Erythronium japonicum - Trout Lily (Katakuri in Japanese) that was outlined in the previous photo. 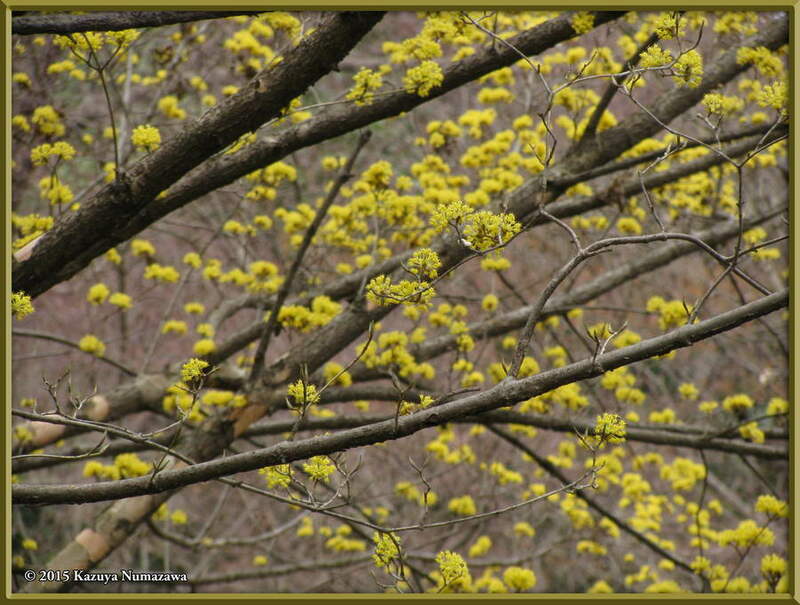 The 2nd shot shows another Cymbidium goeringii Orchid and the 3rd shot is of the flowers of a Cornus officinalis tree. 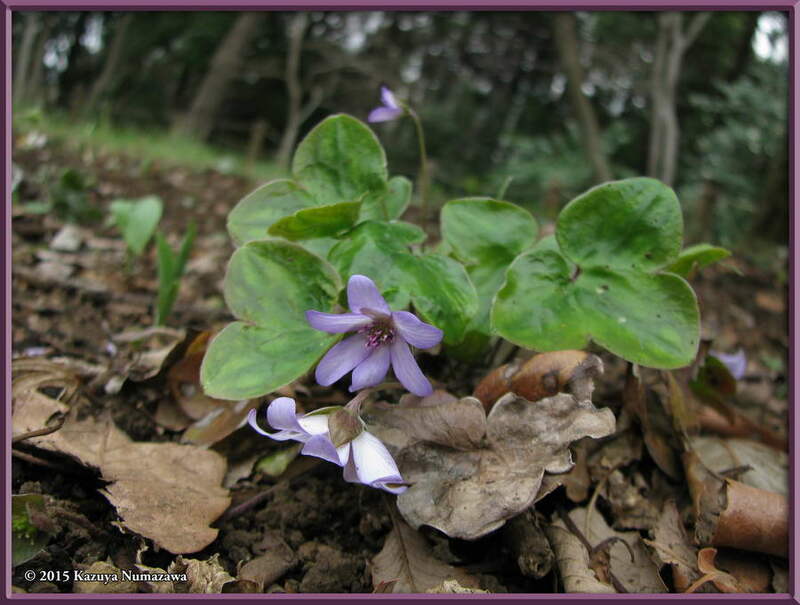 Here is a final shot - for today - of Viola japonica. 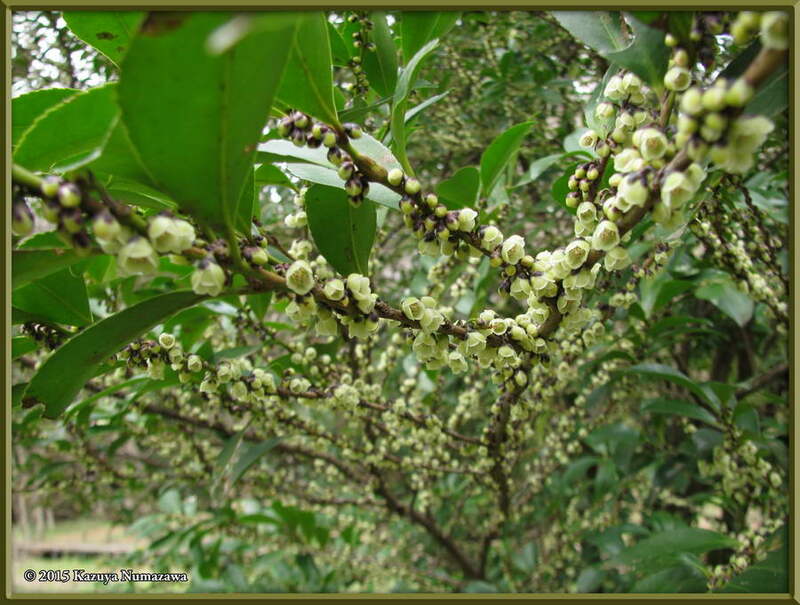 The center photo shows a close-up of the flowers of Stachyurus praecox and the 3rd shot shows the flowers of Eurya japonica. 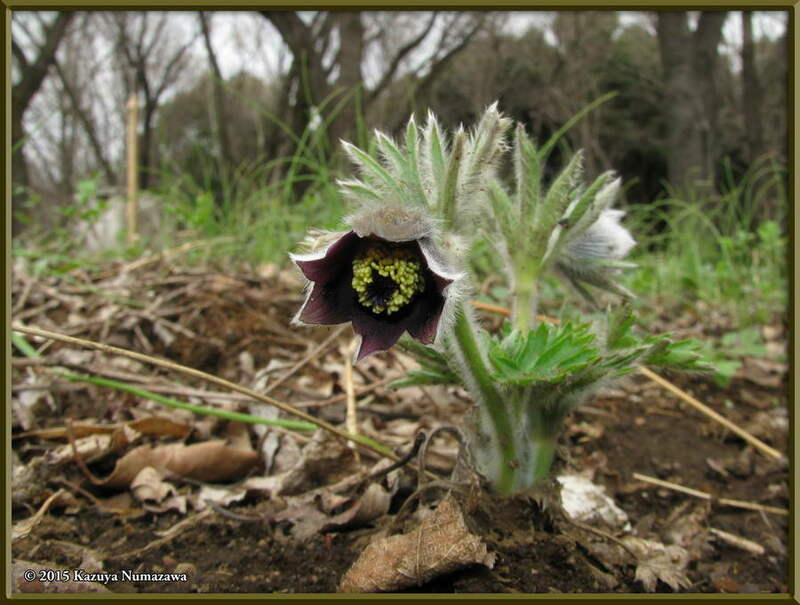 This Eurya japonica had a rather unpleasant smell to it. 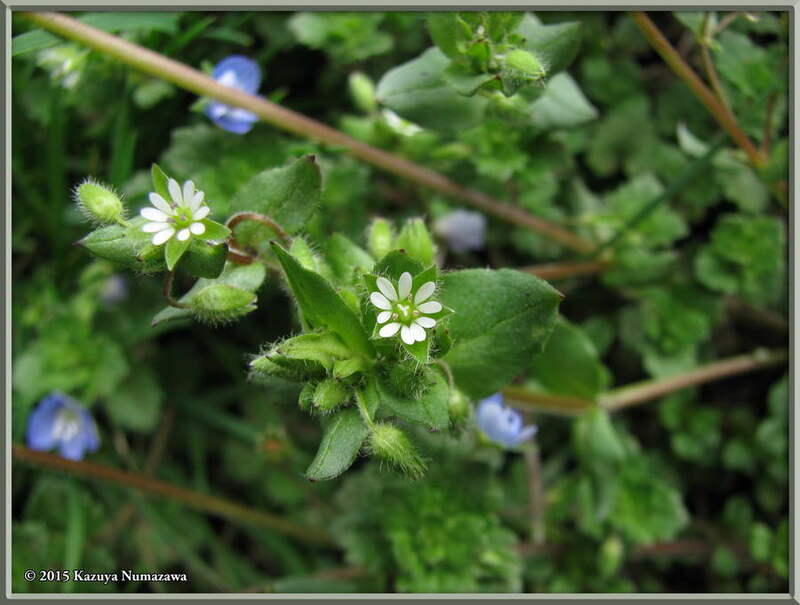 Wonder what insect it is trying to attract for pollination? 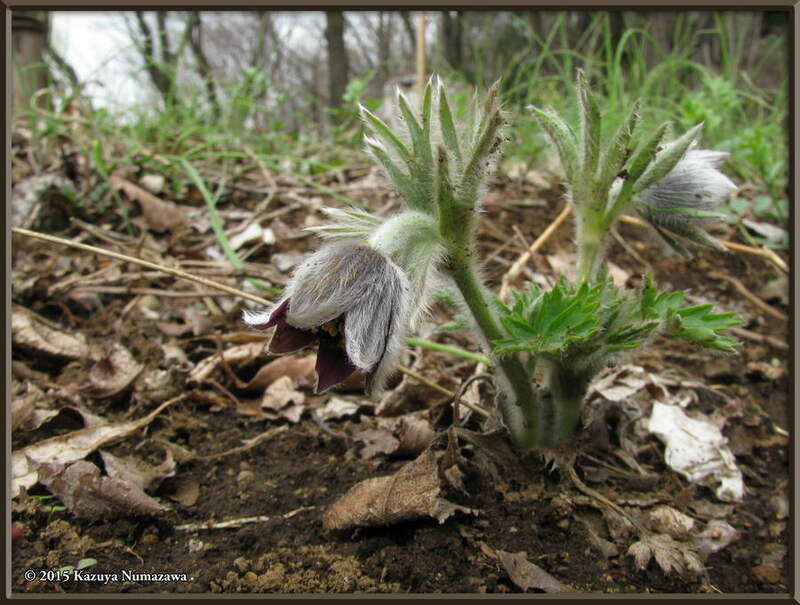 In this row are 3 shots of Pulsatilla cernua. 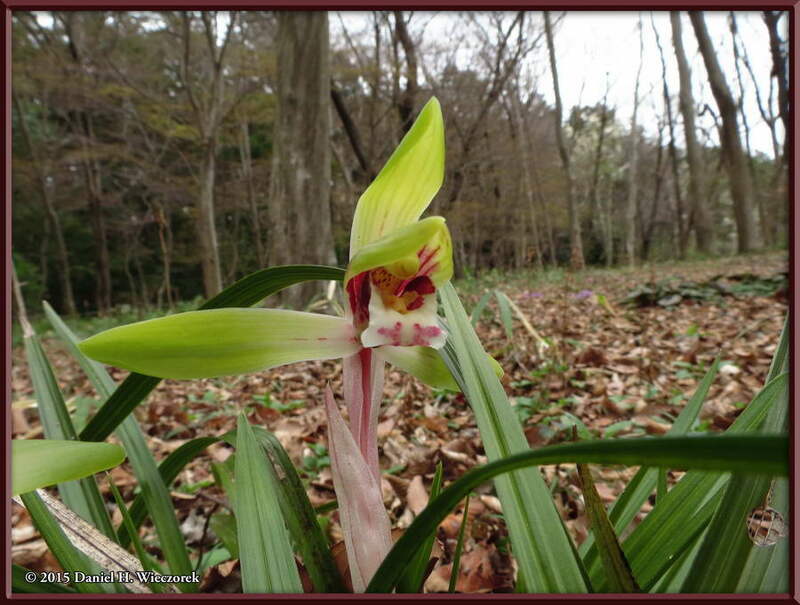 This is the only one of these plants which exists here, so it is a treat to see it in bloom. 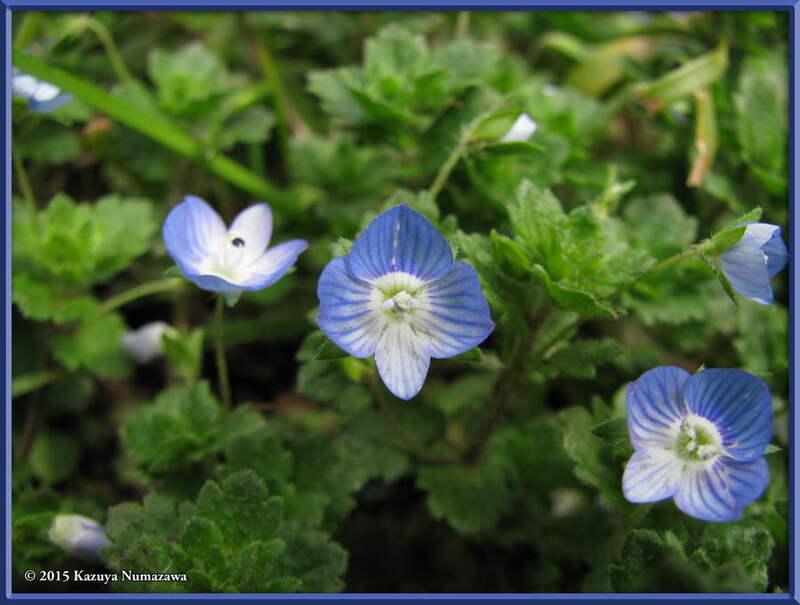 Here are 2 shots of a tiny Veronica flower (Veronica persica) - they came out pretty good! 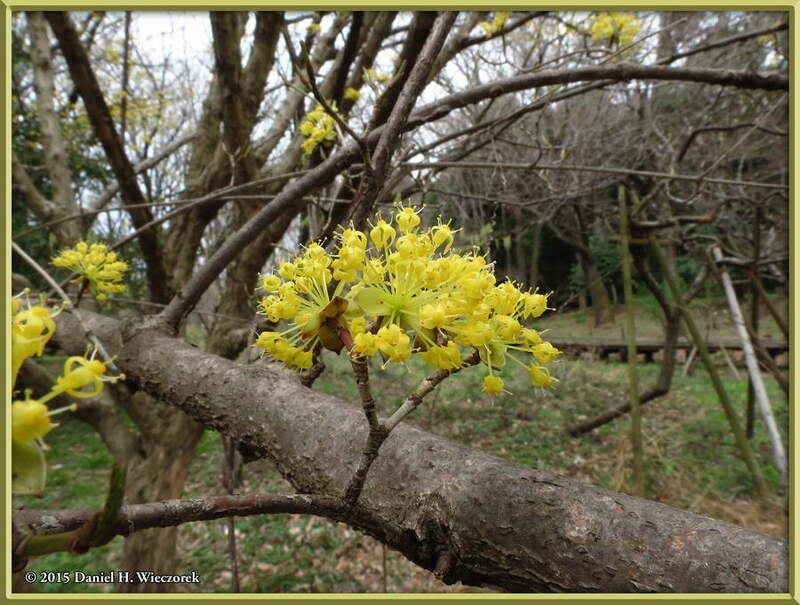 The 3rd shot is another of Cornus officinalis. 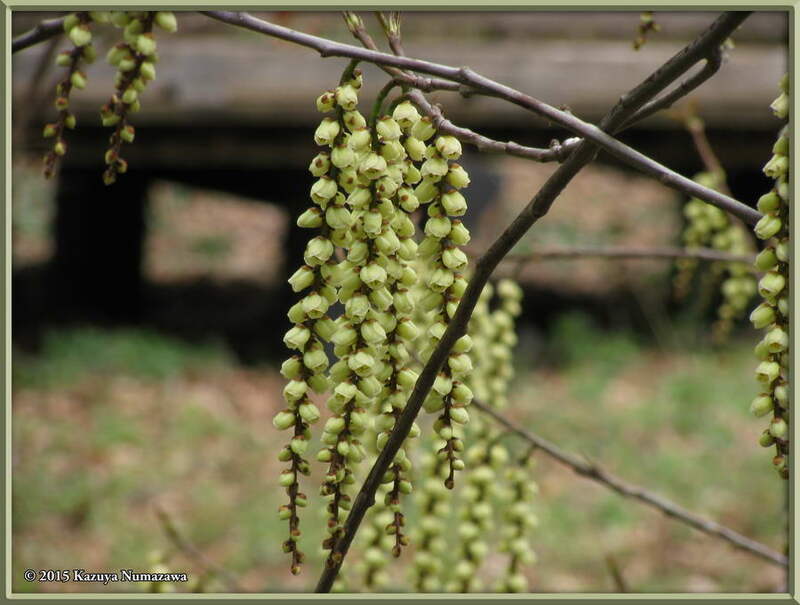 Here, in 1st position, is another shot of the Stachyurus praecox which you saw back in Row 10, but this one is more of a distance shot. 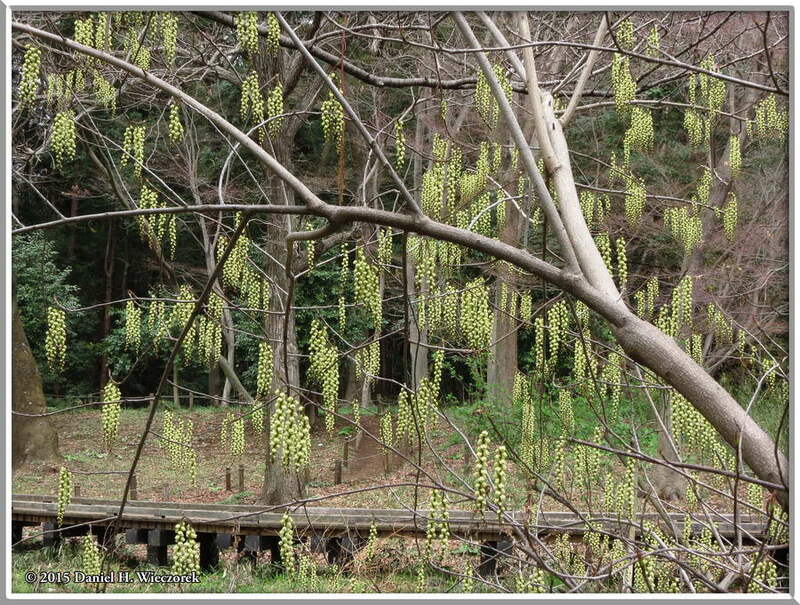 The 2nd shot shows Kazuya and also some Willow Trees (Salix sp.) 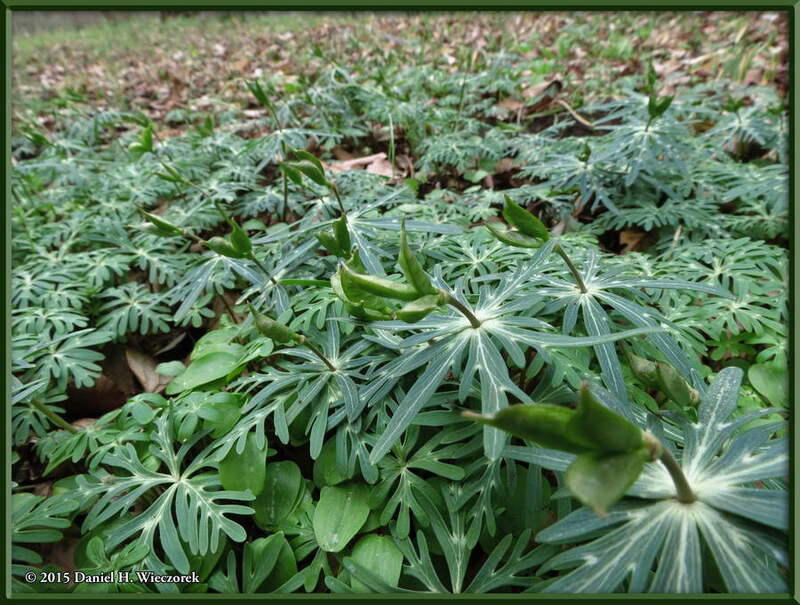 which are budding out. 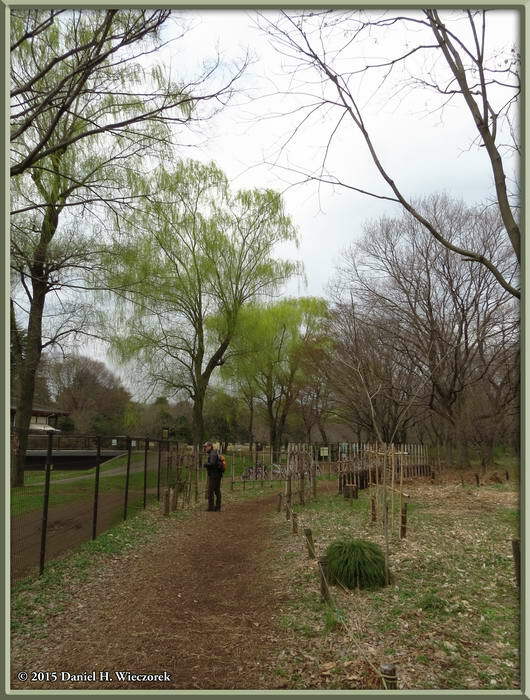 On the left you can see the fence which surrounds this Natural Area in Nogawa Park. It is gated and one is expected to close the gate behind oneself when entering or leaving. In this shot you can also get an idea - note all the rope fences - of the areas which one is not supposed to enter. 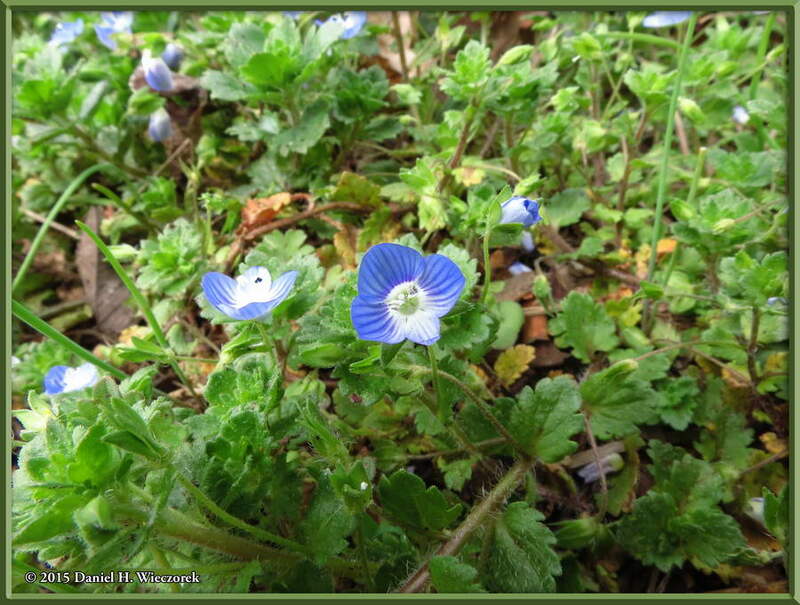 The 3rd shot is another of Veronica persica. Here is a nice shot of Stellaria media and then the final Nogawa Park shot - 3-exposure bracketed photos which have been combined by Tone-Mapping. We are now outside of the Natural Area, it is behind that fence which you can see. 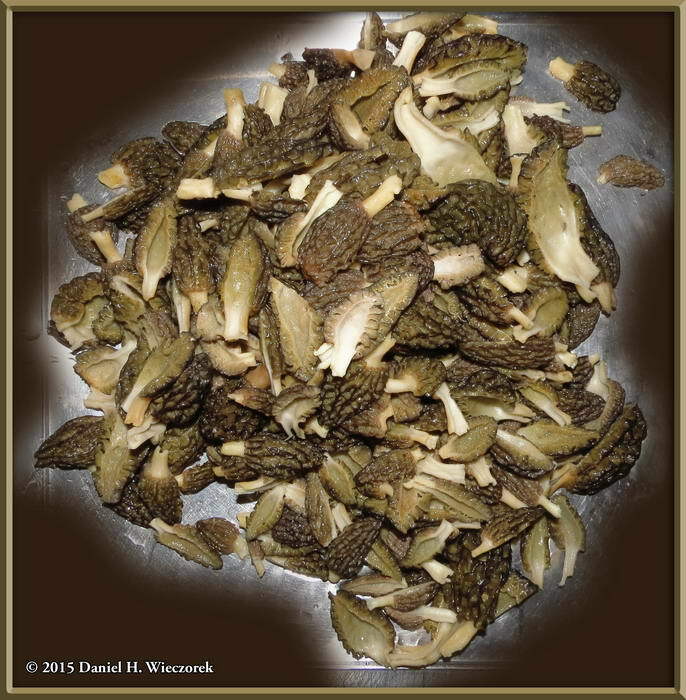 On our way home from Nogawa Park we bicycled through the area where we generally find Morel Mushrooms (Morchella sp.) 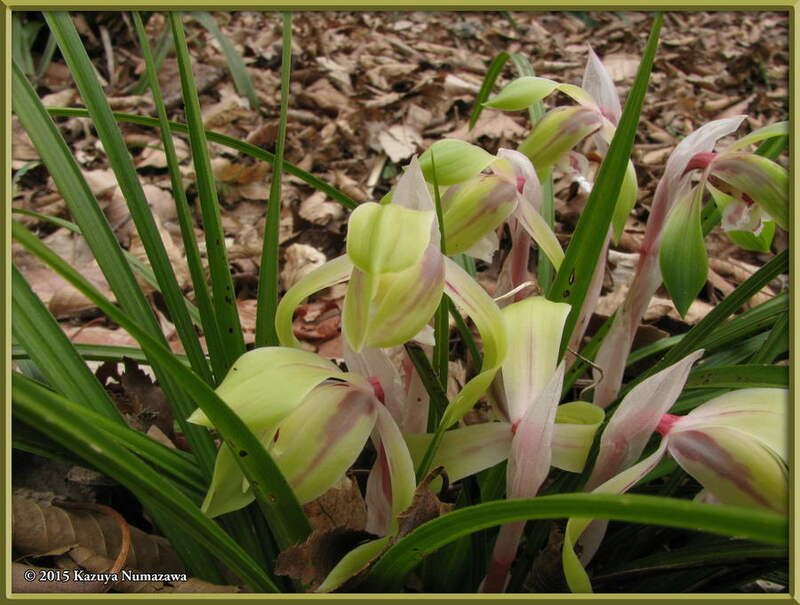 in the early spring - and they were already out! We harvested a very substantial amount to bring home. Then we came home and I started cleaning mushrooms while Kazuya went to the supermarket to find some nice steaks. We ate like kings. These 2 photos do not show the quantity very well. 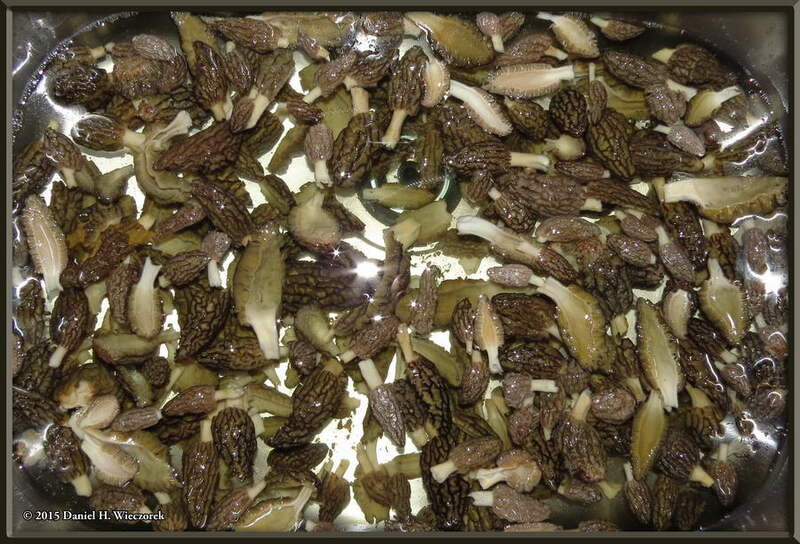 We had a nice bunch for supper, but we actually put more of them into our food dryer than we ate. We have enough dried to have 2 or 3 more "steak and mushrooms" dinners!